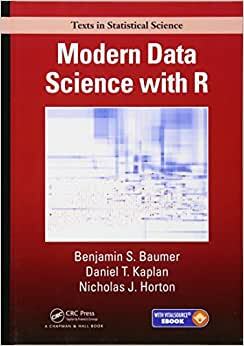 Modern Data Science with R is a comprehensive data science textbook for undergraduates that incorporates statistical and computational thinking to solve real-world problems with data. Rather than focus exclusively on case studies or programming syntax, this book illustrates how statistical programming in the state-of-the-art R/RStudio computing environment can be leveraged to extract meaningful information from a variety of data in the service of addressing compelling statistical questions. Contemporary data science requires a tight integration of knowledge from statistics, computer science, mathematics, and a domain of application. This book will help readers with some background in statistics and modest prior experience with coding develop and practice the appropriate skills to tackle complex data science projects. The book features a number of exercises and has a flexible organization conducive to teaching a variety of semester courses. "Baumer, Kaplan, and Horton have managed to write a book that will serve a huge variety of educators while being endlessly interesting and useful to students of a modern era. Modern Data Science in R is a compilation of ideas from both ends of the data science and statistics spectrum―tools for setting up databases and working with regular expressions are intermixed with fundamentals like regression analysis. Additionally, the authors pull together fantastic examples from the scientific community as well as the media at large. Their examples will engage today's students into understanding why data wrangling, reproducibility, and ethics are a fundamental part of any data analysis. "Modern Data Science with R is different . . .as it presents an abundance of R codes, functions and packages clearly with several useful examples. For people with a statistical background, the book covers computational topics like simulation and also includes appropriate computer science topics such as Data Wrangling, Database Querying using SQL and Text as Data. The book is well-structured and is presented in an easy-to-understand manner, making it suitable for a wide range of readers. . . This book is unique because it incorporates theoretical fundamentals such as statistical learning and regression modelling with the modern, practical elements of data science, including setting up databases and debugging . . . This book is a valuable resource to all those studying and interested in data science." Benjamin S. Baumer is an assistant professor in the Statistical & Data Sciences program at Smith College. He has been a practicing data scientist since 2004, when he became the first full-time statistical analyst for the New York Mets. Ben is a co-author of The Sabermetric Revolution and won the 2016 Contemporary Baseball Analysis Award from the Society for American Baseball Research. Daniel T. Kaplan is the DeWitt Wallace professor of mathematics and computer science at Macalester College. He is the author of several textbooks on statistical modeling and statistical computing, and received the 2006 Macalester Excellence in Teaching award. Nicholas J. Horton is a professor of statistics at Amherst College. He is a Fellow of the American Statistical Association (ASA), member of the NRC Committee on Applied and Theoretical Statistics, recipient of a number of national teaching awards, author of a series of books on statistical computing, and actively involved in curricular reform to help students "think with data." I use this book regularly in my work as an accredited statistician working in industry. I read it in the Fall of 2017. It is clear that the authors have been using these methods for a long time. I am glad they took the time to write this book. This book is both current and highly effective. Benjamin Baumer is very successful in facilitating and enhancing the reader's understanding of data science within the context of R.
2.0 out of 5 starsIf you're already familiar with statistics or R, the book makes a good drink coaster. This book was clearly written for someone who is an aspiring "Data Scientist" with absolutely zero previous knowledge of R and sadly statistics. If you already have a background in statistics, you will find the oversimplification irritating and just plain stupid. I actually felt angry reading some parts, knowing this is entirely inadequate. Someone with a statistics and ML background. Someone who reads a lot of R documentation and R-bloggers. Some who is jumping on the "Data Science" bandwagon and just needs some talking points. People who hate looking at math. all part of predictive analysis and ensemble is too elementary; online tutorial are more advanced, sorry but it's ridiculous..
if you have some bases in data analysis with R, save your money! Look elsewhere!